FINAL SALE. Dramatic and bold describes this contrasting strapless chiffon maxi dress with fabric piping. The Along The Lines Strapless Chiffon Maxi Dress has a strapless sweetheart neckline and lightly padded bust. The top part is made of a substantial fabric with some stretch to it. Contrasting fabric piping decorates the bust, creating an unexpected look. The attached skirt is made of semi-sheer chiffon and has a full length maxi cut. It is lined to the mid-thigh. The back of this dress has a unique design that will ensure you get noticed whether you are coming or going. Elastic bands at the back stretch to fit and an exposed back zipper completes this dress. The Along The Lines Strapless Chiffon Maxi Dress would look nice paired with beige pumps, wedges, or strappy heels for an unforgettable look. Details: Fully lined to mid-thigh. Lightly padded bust. Exposed back zipper. 50% polyester, 35% rayon, 10% nylon, 5% spandex. Hand wash cold with like colors. Do not bleach. Low iron. Small measurements: Length from top of bust to hemline: 47". Bust: 30". You have added Along The Lines Strapless Chiffon Maxi Dress in Teal/Beige into Wishlist. 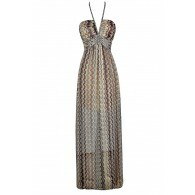 You have added Along The Lines Strapless Chiffon Maxi Dress in Teal/Beige for Stock Notification. 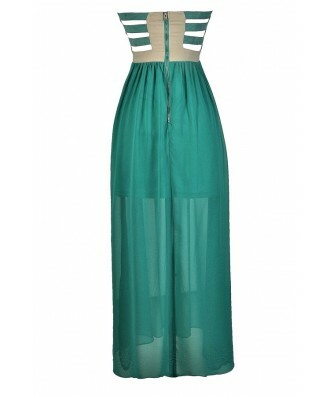 You have set Along The Lines Strapless Chiffon Maxi Dress in Teal/Beige as a loved product. 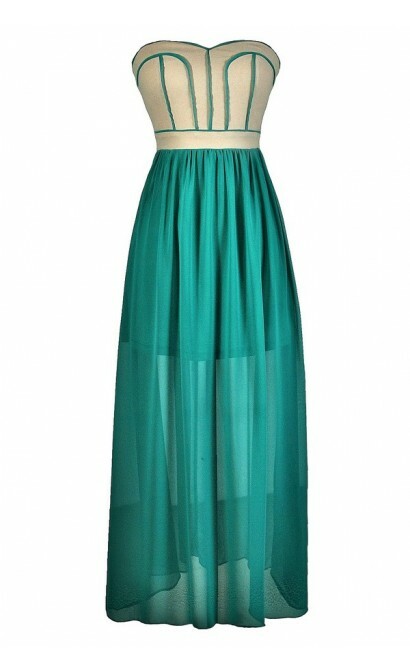 You have removed Along The Lines Strapless Chiffon Maxi Dress in Teal/Beige as a loved product.